ICYMI: The ‘90s are officially back. Missy Elliott performed at the Super Bowl halftime show, Kate Moss is everywhere, and even Johnny Depp is looking like his younger self. What’s more, there are also a ton of noticeably ‘90s-inspired street style trends happening in the world right now—but only a few that really matter. We scoured the globe to come up with a solid list of the five ‘90s fashion trends that are officially back—and that we care about. If you loved Clueless, obsessed over everything Liv Tyler ever did, and kept your eyes peeled for all things Winona Ryder, then this one goes out to you. Keep scrolling to see (and shop) the five 90s trends that are back in a big way! 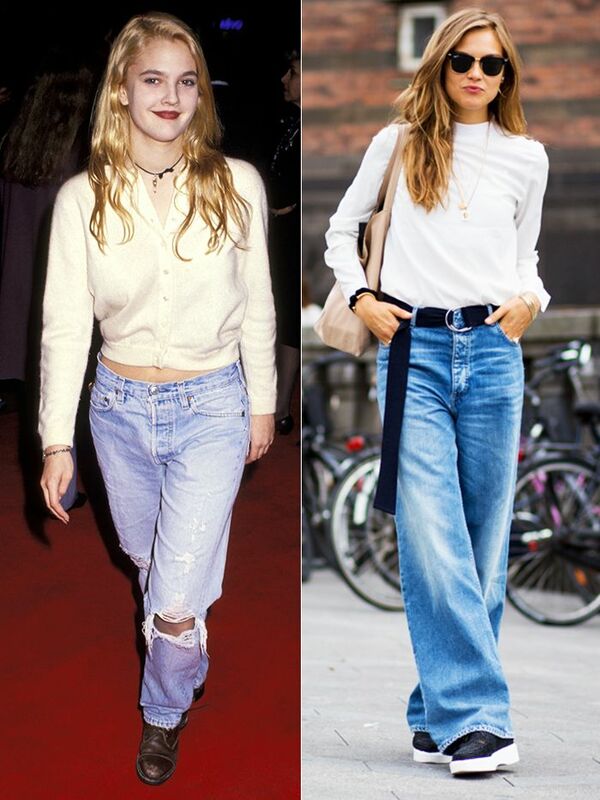 Drew Barrymore unofficially originated the truly slouchy jean way back in 1991—and we’ve been seeing it lately on the streets of major cities from Copenhagen (above) to Paris. If the choker was good enough for Winona, consider it good enough for us. As we already observed, the neck-hugging accessory is officially back—and we’re really not mad about it. The Calvin Klein team has been making a big push as of late to rejoin the style set, circa Kate Moss in the ‘90s. They created the hashtag #MyCalvins, and have been dressing bloggers and street style stars alike in their iconic, logo-emblazoned undies. The boot brand beloved by alt-punk-rock girls in the ‘90s has officially worked its way into contemporary high-fashion. The shoes are especially preferred by models off duty and other more grunge-inspired ladies. What might be considered the crowning jewel of ‘90s fashion, the flannel has had a slow, but steady reentry into sartorial culture. The button-down brand Rails is huge with everyone from bloggers to Beyoncé—and their most popular styles are flannel. Do YOU love the return of the ‘90s as much as we do? Tell us in the comments. And keep reading to see more amazing style from the decade!